【AUSA2017】2017美国陆军年会速报 - 动力传动组 - 装甲车辆论坛 - Powered by Discuz! The AMPV will provide U.S. Army Soldiers with superior survivability protection and all-terrain mobility to go anywhere, which are essential requirements for the battlefield. BAE Systems’ AMPV is a mature, low-risk and cost-effective solution that rapidly delivers continued combat overmatch capability for the Army. The AMPV program is essential to the future of the Armored Brigade Combat Team (ABCT) and will fulfill the Army’s strategy of protection, mobility, reliability, and interoperability. The AMPV, which will be integrated with the ABCT, is required to operate alongside the M1 Abrams main battle tank and the M2 Bradley tracked IFV (Infantry Fighting Vehicle). 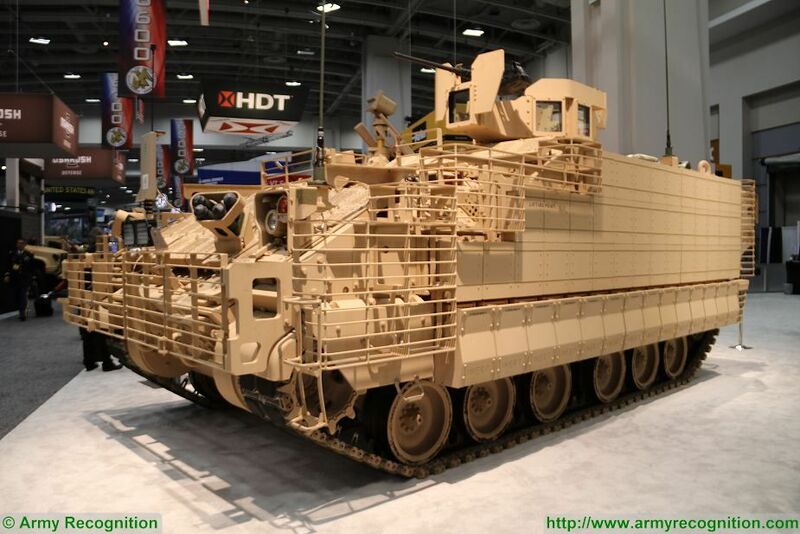 In December 2015, BAE Systems has delivered the first prototype Armored Multi-Purpose Vehicle (AMPV) to the U.S. Army. The AMPV family will includes- five variants including the General Purpose Vehicle, Mission Command Vehicle, Medical Evacuation Vehicle, Medical Treatment Vehicle and Mortar Carrier Vehicle. It is a mature, cost-effective solution that leverages proven Bradley Infantry Fighting Vehicle and M109A7 Self-Propelled Howitzer designs. The General Purpose variant accommodates two crew, six passengers, is reconfigurable to carry one litter, mount crew served weapon, integrates two Joint Tactical Radio System Handheld, Manpack and Small Form Fit (HMS) or two Single Channel Ground and Airborne Radio System (SINCGARS), Vehicle Intercom (VIC)-3, Driver’s Vision Enhancer (DVE), Duke v3, and Force XXI Battle Command Brigade and Below (FBCB2)/Blue Force Tracker (BFT). Science Applications International Corp. (SAIC) announced today at AUSA that it will compete to rapidly develop combat vehicle prototypes to meet the U.S. Army’s need as part of the Mobile Protected Firepower (MPF) program. SAIC, together with ST Kinetics and CMI Defence, will develop and integrate a vehicle that offers the Army an innovative solution that provides infantry forces access to combat environments in 21st century operations. Based on ST Kinetics’ Next Generation Armored Fighting Vehicle (NGAFV) chassis and CMI Defence’s Cockerill Series 3105 turret currently in production, SAIC will compete for an Engineering and Manufacturing Development (EMD) contract to build prototypes that incorporate a lightweight combat vehicle design while still providing mobility and lethality for Army units. Such a vehicle will enable freedom of movement and action, specifically for restrictive, urban operations but tailorable for full-spectrum combat environments. “SAIC has developed a superior solution that integrates mature, currently produced offerings from our industry partners, ST Kinetics and CMI Defence. By marrying ST Kinetics’ chassis with CMI Defence’s turret, SAIC can deliver a reliable vehicle that gives soldiers a new capability in combat environments,” said Scanlon. “ST Kinetics is indeed honored to team up with SAIC again to participate in another major defense program in the U.S. Our NGAFV is an advanced system that is fully digitalized, highly mobile and developed to support networked knowledge-based warfighting. A fleet of seven prototypes had been developed and robustly tested over several years. As the NGAFV will be in production soon, this platform brings minimal technical risk and a robust supply chain to the MPF program,” said Dr. Lee Shiang Long, president of ST Kinetics. GMT+8, 2019-4-24 11:09 , Processed in 0.073404 second(s), 23 queries .